As the fire approached H-2, Helitack Crewmembers Browning and Tyler headed toward the smokejumper Drop Zone located about 1,000 feet to the northeast (South Canyon Report). The helicopter pilot tried to make radio contact with the two helitack crewmembers; he could not see them and they did not respond to his radio calls. The high winds, air turbulence, smoke, and the approaching fire forced the helicopter to leave the area. Firefighters entering the East Drainage radioed and yelled for the two helitack crewmen to follow them down the drainage (OSHA 1995). Tyler and Browning replied that they needed to go up the hill—to “run the ridge” (OSHA 1995). It is not clear where the two firefighters were headed. Perhaps they felt the East Drainage to be unsafe, or they expected to be picked up by the helicopter that was flying over H-2 at this time. 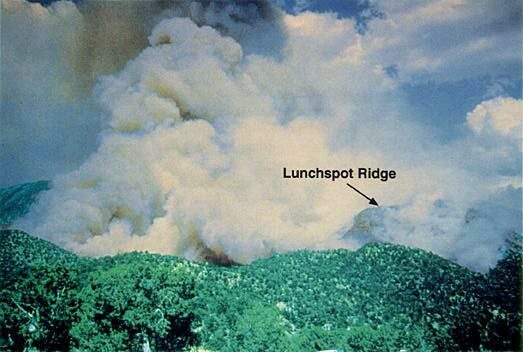 Fire quickly engulfed the entire Main Ridge from the Rocks near H-1 to the smokejumper Drop Zone. A portion of the fire ran northeast across the saddle between H-2 and the Drop Zone, cutting the two helitack crewmen off from the East Drainage (fig. 33). 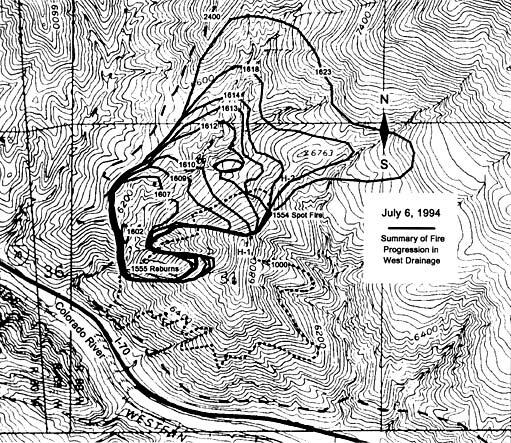 This fire caused the firefighters below H-2 to turn and go straight down the East Drainage rather than follow a contour route toward the northeast (South Canyon Report; OSHA 1995). The helitack crewmembers were forced by the fire to go northwest from the Drop Zone toward a bare rocky outcropping. As they neared the rocky face, they encountered a 50 feet deep gulley. Evidence gathered during the postfire inspection suggests that after entering the gully, they set their gear down and moved about 30 feet down the gully where they attempted to deploy their fire shelters. Based on a reenactment of the travel time between the red bags near H-2 and the helitack fatality site, we estimate that the two firefighters reached the gulley and attempted to deploy their shelters between 1622 and 1623 (fig. 34). The postfire evidence suggests that the two firefighters, Robert Browning and Richard Tyler, were incapacitated and died when they were engulfed in hot air and smoke before they could fully deploy and enter their fire shelters. East Drainage—Blanco, Shepard, and Scholz followed the Main Ridge Group down the East Drainage (approximately 1614 to 1615). They arrived at the Interstate between 1715 and 1730 (Scholz 1995). Lunch Spot Ridge—The eight smokejumpers hiking up the Lunch Spot Ridge reached their shelter deployment site at approximately 1619. They deployed in two groups, six nearest H-1 and two a short distance farther down the ridge. The deployment area had burned in previous days and was a short distance (235 to 430 feet) below the junction of the Main Ridge and Lunch Spot Ridge (H-1). Smokejumper Petrilli called Mackey over the radio about 1619 but did not receive a response. Petrilli checked his watch as they entered their shelters; the time was 1624. 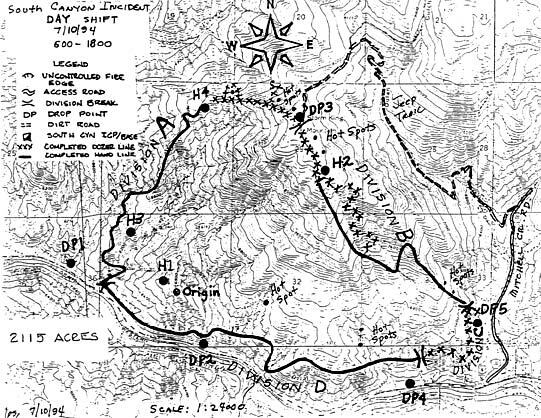 Over the next 45 minutes the eight smokejumpers felt heat from three separate fire runs that occurred about 500 feet south of them (Petrilli 1996). Figure 33—Fire perimeter at 1618. Fire is burning along the Main Ridge from H-1 to the Smokejumper Drop Zone. It is also burning northeast across the saddle, cutting Helitack Crew-members Tyler and Browning off from East Drainage (1618). Following Blanco’s call for support, airtankers were dispatched to the fire from Grand Junction. They were off the ground around 1630 and were over the fire within 20 minutes. High winds and heavy smoke prevented the planes from getting near the fire. Photos and video (Bell 1994) taken from the heliport at the Canyon Creek Estates subdivision at about this time show a large smoke column building over the entire West Flank (fig. 35). The pilots spotted the shelters of the eight firefighters who deployed on the Lunch Spot Ridge below H-1 and dropped retardant around the deployment site (fig. 36). Smoke totally obscured the slopes north of the Lunch Spot Ridge. Because the smoke and high winds showed no signs of quickly abating, the airtankers were released (South Canyon Report). Figure 34—Fire perimeters from blowup (1602) to 1623. Longanecker, who had hiked up the Lunch Spot Ridge, joined the eight smokejumpers near the top of the Lunch Spot Ridge as they emerged from their shelters (1800 to 1830). The fire had almost totally consumed the Gambel oak on the entire west-facing slope of the Main Ridge, leaving scattered, burned stobs. The area was cool enough to cross on foot, and the smokejumpers began looking for the other firefighters. Seeing objects that looked out of place with the surroundings near the top of the West Flank Fireline, some of the smokejumpers walked over to the area. There they found 12 firefighters who had died in the fire. After notifying the authorities of the fatalities, the nine smokejumpers hiked to H-2 to wait for the helicopter to ferry them off the mountain. Archuleta, who had hiked out the East Drainage, joined 28 smokejumpers at the helibase at Canyon Creek Estates (directly west of the fire site). About 25 of the smokejumpers were ferried by helicopter to the Main Ridge to continue search and rescue operations. On the return trips, the helicopter ferried the smokejumpers who had sheltered on the Lunch Spot Ridge back to the helibase. Those searching for the two missing helitack crewmembers walked out the West Drainage after dark. The bodies of the two helitack crewmen were found on July 8, 1994. The fire continued to spread eastward toward Glenwood Springs covering approximately 2,000 acres by nightfall. Maps of the fire perimeter made on July 10 indicate that the fire had burned about 2,115 acres (fig. 37). 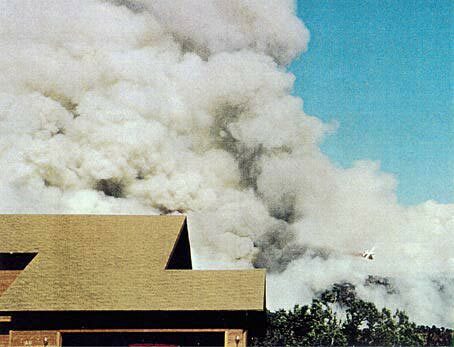 The fire was declared controlled on July 11, 1994. 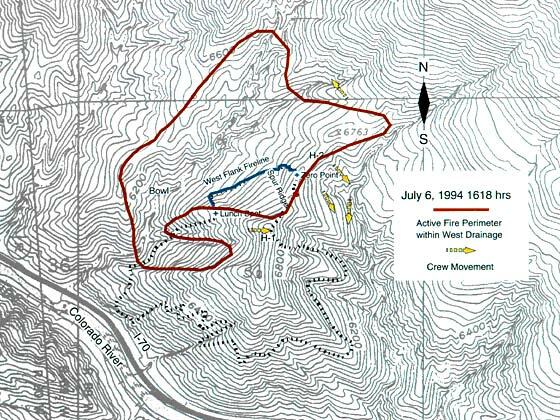 Figure 37—South Canyon Fire Day Shift Fire Map for July 10, 1994. This map shows the approximate final fire perimeter and fire size of 2,115 acres.